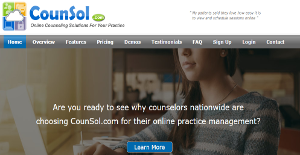 CounSol is a complete practice management solution that is designed specifically for practitioners in the counseling and mental health practice. The software provides mental health professionals such as solo clinicians, psychologists, therapists, and counselors with a fully customizable platform that allows them to effectively manage their clients, schedules, tasks, payments, and more. CounSol is an effective platform in bringing down the instances of no-shows, improving scheduling capabilities of users, and accepting online payments among others. The application also comes with a secure portal for clients which they can access to view their appointments, programs, and invoices. With CounSol, counselors and other professionals are more than capable of running and growing their entire practice. CounSol delivers a user-friendly practice management solution for professionals in the field of counseling and mental health. Even those who are quite technologically challenged find the software very friendly and intuitive, allowing for even novice users to fully utilize and greatly benefit from the system right off the bat. Keeping records is quite essential for any practitioner and CounSol excels greatly in that regard. The system simplifies keeping and storing client notes, which are all placed in a centralized and secure database that can be accessed for quick reference and history check. Many users find the electronic scheduling tool as one of the software’s most useful features. This allows them to easily make schedules and confirm the attendance of their clients, bringing down the number of no-shows. The scheduling tool also speeds up the scheduling process, saving users lots of hours that they used to spend on seeking and contacting clients via email or over the phone. CounSol makes invoicing and billing a breeze. Users don’t have to exit the system to submit out of network insurance claims of their clients. They can do it right from CounSol’s interface. Many of CounSol’s features are in compliance with prevailing standards and policies, putting users at ease whenever they make transactions. If you are considering CounSol it may also be sensible to check out other subcategories of Best Business Process Management Software gathered in our base of SaaS software reviews. Every organization has different requirements and needs a software that can be personalized for their size, kind of staff members and customers, and the specific industry they are in. For these reasons, no platform can proffer perfect tools off-the-shelf. When you look for a software product, first be sure what you want it for. Read some CounSol reviews and ask yourself do you desire basic features or do you want complex functionality? Are there any industry-specific functionalities that you are searching for? Get the answers to these queries to help your search. There are lots of factors that you need to mull over and these include your budget, particular business wants, your organization size, integration needs etc. Take your time, try out a few free trials, and finally select the app that provides all that you need to enhance your firm effectiveness and productivity. How Much Does CounSol Cost? We realize that when you make a decision to buy Business Process Management Software it’s important not only to see how experts evaluate it in their reviews, but also to find out if the real people and companies that buy it are actually satisfied with the product. That’s why we’ve created our behavior-based Customer Satisfaction Algorithm™ that gathers customer reviews, comments and CounSol reviews across a wide range of social media sites. The data is then presented in an easy to digest form showing how many people had positive and negative experience with CounSol. With that information at hand you should be equipped to make an informed buying decision that you won’t regret. What are CounSol pricing details? What integrations are available for CounSol? If you need more information about CounSol or you simply have a question let us know what you need and we’ll forward your request directly to the vendor.